African slaves brought to the Americas were part of the “Middle Passage,” a voyage that began in Europe, stopped in Africa to unload supplies and pick up enslaved human cargo, and then traveled to American ports on the eastern coast to trade that human cargo for goods that were then shipped back to Europe. This troubling part of American history—and important part of African American history—can be uncovered and explored with patient historical research, including searching in old newspapers such as GenealogyBank’s online Historical Newspaper Archives. Read more about U.S. legislation in the 1800s regarding slavery in GenealogyBank’s Historical Documents section which contains The American State Papers and more. However, the Act to Prohibit the Importation of Slaves and a similar law passed in the United Kingdom didn’t end the practice of the slave trade. Slave ships illegally continued to bring their human cargo to U.S. ports, and American newspapers continued reporting on the occasional capture of a slave ship into the 1840s. (Two ships, the Wanderer and the Clotilde, are reported to have brought slaves to the United States well into the 1850s.) As with the passage of most laws, those who would break the law don’t end their criminal deeds; instead a black market thrives. Eighteenth-century newspapers found in GenealogyBank’s archives report of the comings and goings of slave ships, when the African slave trade was still legal. From advertisements to shipping news articles, researchers can find mentions of slave ships names, their captains, and descriptions of the people on board. 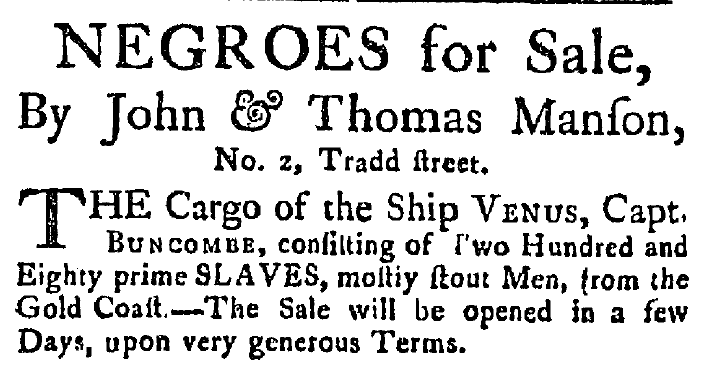 In some cases, advertisements for the upcoming sale of slaves included information on the ship they would be arriving on. 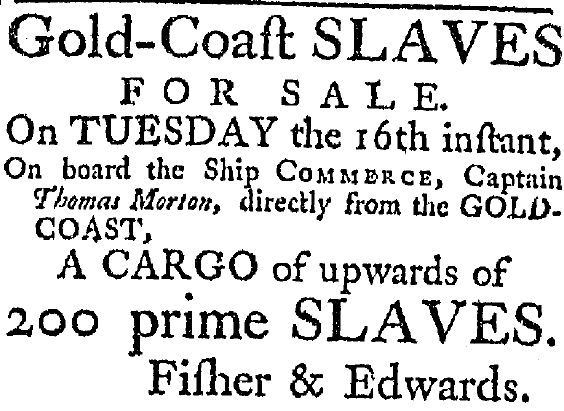 In this example from a 1785 South Carolina newspaper, Fisher & Edwards advertise that the ship Commerce, under Captain Thomas Morton, will be arriving from Africa’s Gold Coast with “upwards of 200 prime slaves” for sale. Articles under “Shipping News” or “Marine List” headlines are a good place to start searching for information about slave ships, crew, and cargo. 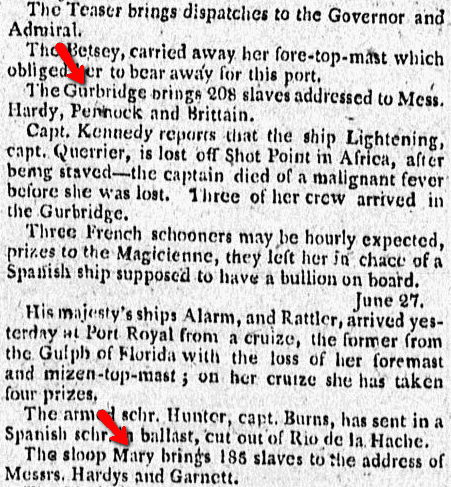 In this example from a 1799 New York newspaper, we see updates on various ships including information about deaths on ships. We also see that the Gurbridge and Mary were bringing slaves, and to whom they were being brought. After exhausting your research in newspapers, learn more about a particular slave ship by consulting the Trans-Atlantic Slave Trade Database website, which houses information about slave ships from 1514 to 1866. In some cases digital collections may hold slave ship manifests, such as this example from the Metropolitan New York Library Council Digital Collections. Don’t forget to look for finding aids like this one from the New York Historical Society’s Guide to the Slavery Collection 1709-1899. The Slave Manifests for the Port of Philadelphia, 08/1800-04/1860 website is from the same Record Group as the above manifests, Record Group 36: Records of the U.S. Customs Service, 1745-1997. These online websites can be helpful, but research on the name of a slave ship should begin with historical newspapers. It’s in their advertisements and news articles that you will find mentions of the slave ships’ cargo, crew, and destination. You are free to share the History of the African Slave Trade in Early America and the United States Infographic on your blog or website using the embed code below. * The Trans-Atlantic Slave Trade Database. http://www.slavevoyages.org/tast/index.faces. Accessed 23 February 2014. ** “March 2, 1807.” This Week in History, March. http://www.peacebuttons.info/E-News/images/peacehistorymarch.htm. Accessed 23 February 2014. *** “An Act to Prohibit the Importation of Slaves into any Port or Place Within the Jurisdiction of the United States, From and After the First Day of January, in the Year of our Lord One Thousand Eight Hundred and Eight.” The Avalon Project. Yale Law School Lillian Goldman Law Library. http://avalon.law.yale.edu/19th_century/sl004.asp. Accessed 23 February 2014. The May 1861 Contraband decision by General Butler at Fort Monroe during the beginning of the Civil War was a significant change in slavery in America. It should be included in future revisions to this great infographic. While the contraband decision did not free slaves, it began the practice of not returning runaway slaves to their owners as required by US law of the time and offered safe haven to hundreds of thousands slaves behind the lines of Federal forces. It is very significant as it help lead Abraham Lincoln to issue the Emancipation Proclomation. I would like to know where I come from. Wendell- The best place to start, is to start with what you know. Start with parents and grandparents and go back. If your parents or grandparents are still living, ask them about their parents and grandparents. You will want to research where they lived and their customs. Searching census records can answer some of these questions and give you a general idea of dates, places and siblings. Newspapers have obituaries that give family names, relatives and places. A good website to start with for census records would be FamilySearch.org. Some praiseworthy research, but the number of Africans impacted by the Ma’afa is closer to 112 million and upwards of 230 million including children in utero and future offspring. 6 million is a gross understatement and a factual misrepresentation. According to the Voyages database, the total between 1514-1875 to ALL countries and regions was 9,901,365. Can you tell me where you got your numbers? I am unable to access the Voyages database… Any idea if it is still up and running? It’s said that my family arrived from south Africa? How many slaves came from West Africa? I started my ancestor tree in 1988 and could only go back as far as 1835, Prince Frederick, Calvert County, Maryland. My father said his ancestors were Tutsi and Native American. Can you point me in the right direction? Disturbing — but are these facts based on actual written records found with proof, or just made up theories and insights on maybe what happened? So much has been hidden and erased on purpose. Is there really proof of the ships, and the census of slaves documented upon arrival due to name changes, which makes it even harder for me to search? Are the numbers based on reality or a claim, for example 1 million slaves? Was there a slave ship named “Savoir”? To or from Martinique? I don’t know the answer to your question but I wonder if the website, The Trans-Atlantic Slave Trade Database might provide an answer, http://www.slavevoyages.org/ . Hi, I was doing some research on both black and white slavery in the states. From what I’ve gathered thus far, European slave trade was quite common between Europeans and Muslims. I was hoping to learn more about white slavery and the numbers of free blacks that owned slaves in the South. Your blog page is a good source for information; thank you for your dedication. You could also look into “Free Black Owners of Slaves: A Reappraisal of the Woodson Thesis” (https://www.jstor.org/stable/27567319?seq=1#page_scan_tab_contents). Slavery’s many facets prove to make it a rather interesting topic. We thank you for your enjoying our blog! I was on the Slave Voyages database and according to it, no slave was brought to North America until 1651. The majority of slaves were sent to the Carribean, Brazil, “Spanish Mainland America” (South America, Brazil, Argentina, Haiti, etc.) and areas of Africa. Most slave ships were also Spanish. So I don’t know where the info came from that stated slaves were brought here in 1619. Can you point me in the right direction for that information, and is it proven evidence? I’m sorry, but I don’t take anything as truth unless there are more than three separate verifications. Search up growtopia on the app store. that is your answer.